I saw Ysolda Teague's Liesl pattern over on Amy Singer's blog and loved the pattern, especially since Amy made hers with Patagonia Nature Cotton which I happen to have a bit of. The pattern is top down feather and fan and offers several options (all shown in the photographs) for creating your top. Samples are shown in several different yarns. I ended up making this one in Malabrigo Worsted. 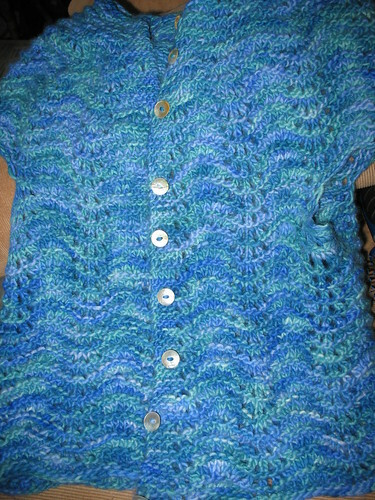 It was great fun and I ended up using the shell buttons so as not to detract from the colorway. It's been a great transitional piece as we head into cooler weather. Love it! Does it fit well? Gorgeous! Are you a fast knitter or just knit all the time? I'm jealous of how many projects you finish! It fits pretty well. There's not a lot of shaping, but the lace molds, if you will. And I am sort of fast, and I also knit a lot. It also helps that I mostly show off finished stuff and ignore the abandoned projects.